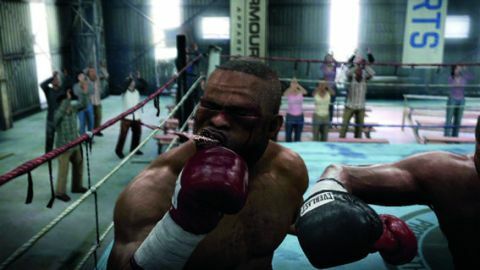 When it hit the Xbox 360 back in February, Fight Night Round 3 was the most impressive-looking game most people had ever seen. The boxers verged on photorealistic, and the knockouts - which featured slow-motion hits to faces that rippled and sprayed blood-tinged spit - were disgustingly awesome. It was, in short, a hard act to follow, especially for a console that claims to be $200 better than the 360. The game, however, is essentially the same - players flick and rotate the right analog stick around like a pair of fists to deliver punches and take their boxer to victory, preferably by knockout. There's more to this than punching, though; Fight Night comes closer than any other game to mimicking the strategy of boxing, capturing the careful ebb and flow of real matches almost perfectly. You'll need to think on your feet to survive, and knowing how and when to block, parry or dodge is as vital as landing haymakers to swollen eye sockets. The learning curve is pretty steep, but with practice, you'll soon be throwing punches and defending yourself with almost no effort. And when you start landing freight-train punches that thud home with sickening crunches and snaps, it'll all be worth it. Description The finest, best-looking boxing game ever is somehow even better on PS3, with slicker graphics and a jaw-smashing first-person mode.